The initial idea for the Urban Jungle Pack was to create an AR-system that offered virtual, location-based information as well as the freedom to move around unencumbered — in principle what Google Glass does today. From that point we developed a mobile system that could not only search for and present location-based information, but could be used by the wearer to collect, send and publish information. With the name Urban Jungle Pack, the media system was later tested and used to provide live coverage at events such as the Love Parade 1999 and Open Art Munich 2000. 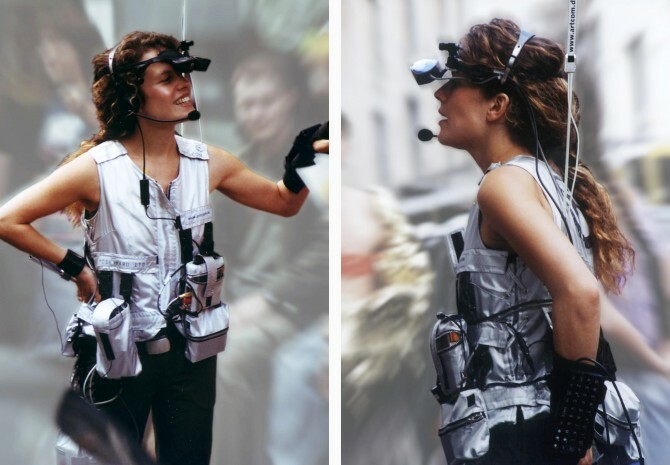 The Urban Jungle Pack consisted of several elements: on the head of the wearer sat a system made up of a translucent display in front of the eyes, a video camera, a microphone and a small speaker on the ear. Worn on the back was a Linux Computer, with the batteries carried over the stomach. The Urban Jungle Pack was fitted with a Global Positioning System, a compass, a ten-inch screen and a keyboard. Location-specific information was presented via the data glasses, e.g., geographical maps with position markers, and text and image information on buildings. Live images, sounds and text could be captured with the video camera, microphone and keyboard. The data was transmitted through networks via a mobile telephone signal. A streamlined version of the system was later tested for use in the maintenance of industrial plants. The idea behind it was that with a worker equipped with such a system instructions could be given by an expert off-site. Instead of transmitting the data via mobile phone lines, wireless LAN was used. The development of the Urban Jungle Pack was supported by Berkom, a Deutsche Telekom subsidiary, as an application that made use of the rapidly expanding UMTS Network of the time.